Bernstein Innovation has created the first serially-produced 3D-printed football shin guards in the world. The idea for the 'Zweikampf' was conceived two years ago and is now able to be pre-ordered exclusively on kickstarter for one month starting 18 April 2016. 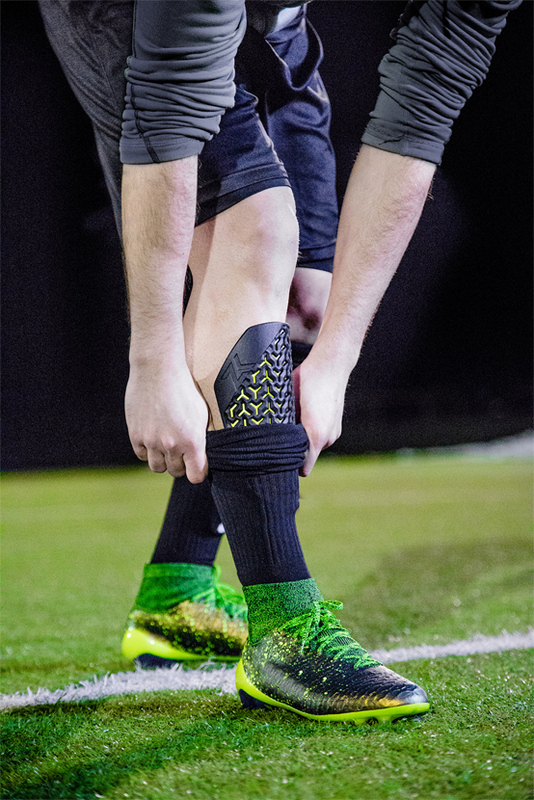 Three high-tech layers comprise the shin guards providing comfort and variation in the size and degree of hardness. A 3D-printed shell is inspired by the model of the Samurai. The second and third layers closest to the shin are crafted from XRD multifunctional material with the middle layer forming the protective hard layer and the 'Inlay' providing utmost comfort. Zweikampf shin guards weigh as little as 75 grams, are 7mm thick and styled in the sleek-looking black and yellow colours. The guards have been designed against 250 shin scans to match as closely as possible to eliminate any pressure points. Bernstein Innovation Ltd. is a young family business founded in 2014 by father and son Klaus and Jakov Schmied, designing and producing high-tech components for the electrics and automotive industries.